Nano Gear's design takes elements from the members of Big Hero 6. The handle is a deep blue with ridges across its form, similar to the color scheme and pattern of Fred's costume, with one of Go Go Tomago's discs on the bottom and Hiro Hamada's Megabot at the top. The Megabot's face is in its yellow, happy side on one side, and red and angry on the other. The guard consists of a curve resembling Baymax's armor, with twin black boosters at the bottom and twin plasma blades similar to Wasabi's at the sides. 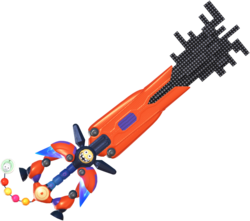 The blade resembles Baymax's rocket fist, and the teeth consist of Hiro's microbots in a scattered pattern. The Keychain is a white string with Honey Lemon's chem-balls, with the token being the symbol of Baymax's healthcare chip. Concept art of the Nano Gear.